In this page we have gathered the most common cases of errors and problems you may observe when using VB Migration Partner or when running migrated .NET projects. 1. Did you install all required software components? Of course you should also ensure that you have registered and activated VB Migration Partner on the computer on which you are attempting the migration. VB Migration Partner must be installed using its companion setup procedure. Just copying the files from a computer to another computer doesn’t work. 2. 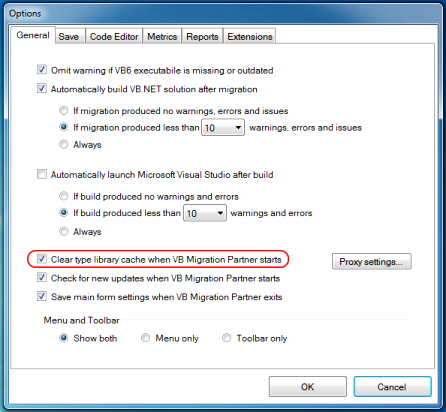 Did you install the most recent version of VB Migration Partner? Download the most recent version of VB Migration Partner. (You can easily reach this page by means of the Help-Download upgrades menu command). Uninstall VB Migration Partner, using Windows’ Control Panel. If you notice that your VB Migration Partner Trial Edition is generating truncated .NET source files, odds are that your trial period has expired. In general, we provide a trial period that is long enough for you to test VB Migration Partner and ascertain that it is able to convert the most critical portions of your VB6 application. By the time when the trial period expires you should be able to reach a decision about purchasing VB Migration Partner. 4. Did you correctly install VB Migration Partner’s patches? If the files you received are meant to fix a problem related to code generation, you should re-migrate the VB6 project. By doing so you lose all the changes you made on the generated .NET project, and for this reason we strongly recommend that you apply all your fixes by means of pragmas, as opposed to editing the generated .NET source files. Pragmas and our convert-test-fix methodology give you the ability to repeatedly migrate the same VB6 project over and over – possibly with different migration options or with newer, more powerful versions of VB Migration Partner - without having to manually fix the generated code at each migration. Use a file comparison utility – for example, WinMerge – to compare the old and new version, so that you can manually re-apply all the manual changes. Even better, instead of re-applying the manual changes in the generated code, go back to the original VB6 project and add one or more InsertStatement, ReplaceStatement, or PostProcess pragmas so that you’ll never need to manually edit the generated code. 5. Are you running VB Migration Partner in a virtual machine? The EULA terms specify that you require the Site License in order to execute VB Migration Partner in a virtual machine. If you find that VB Migration Partner truncates the .NET source files it generates, ensure that VB Migration Partner isn’t running in a virtual machine. 6. Are you running a single instance of VB Migration Partner from a local drive and with administrative privileges? VB Migration Partner hasn’t been designed in such a way that multiple instances can run at the same time. If you experience random fatal errors, ensure that you aren’t running another instance of VB Migration Partner in the background. Besides, VB Migration Partner must run under full privileges, therefore you must run it from a local drive and with administrative privileges (or equivalent). This tip also applies to the VBMP.EXE utility used to perform migrations in batch mode. Please read this article for more information about how to run multiple instances of VB Migration Partner. 7. Does the VB6 project compile and run correctly? VB Migration Partner requires that all the components that the VB6 projects require – both at compilation time and at runtime – be installed on the computer on which you are attempting the migration. The simplest way to meet this requirement is ensuring that the VB6 project compiles and runs without errors on the computer on which you are attempting the migration. 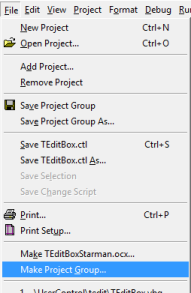 If you are converting a project group, ensure that it compiles correctly as a whole, by means of the File-Make Project Group menu command in the VB6 IDE. Here’s the scenario: you have used VB Migration Partner Trial Edition to generate a .NET project; the .NET project runs fine but doesn’t seem to react to keyboard or mouse actions. The reason for this behavior is that you modified the generated .NET project in ways that aren’t permitted by VB Migration Partner Trial Edition’s EULA. Such unpermitted changes include – but aren’t limited to - adding forms, classes, modules, and structures. When you edit the generated code in this way, all events cease to be fired. You can easily confirm that events aren’t firing by loading the generated project inside Visual Studio and placing a breakpoint in the method that handles an event that must be fired, for example the handler for the Load event of the main form. If the breakpoint is never encountered, then it’s an evidence that the event isn’t fired. The only solution for this problem is that you undo all your unpermitted changes. Or that you purchase a full license of VB Migration Partner. 9. Did you check VB Migration Partner’s activity log? In most cases, the error messages in this window are self-explanatory and can reveal the cause of the malfunctioning and its solution. 10. Are you running the .NET project on the same computer where you migrated it? If the generated .NET project works well on the computer where VB Migration Partner is installed but not on another computer, make it sure that you correctly installed and registered the COM components. 11. Did you search VB Migration Partner’s knowledge base? Half the queries our tech support team receives each day could be solved by simply searching our ever-growing knowledge base. As of this writing there are over 250 distinct KB articles available on our web site, and we add new articles virtually each day. Please notice that the knowledge base you can search online is the same KB that our tech support team queries when one of our customers submits a query. By searching the KB yourself you can often save both your and our time, and solve the problem in a matter of minutes. 12. Were all ActiveX controls and type libraries correctly installed? The major and minor version number of the control/typelib is the same among all the VB6 projects being migrated. Their path matches the path found in the .vbp file of the VB6 project being converted. IMPORTANT: it is essential that you have installed the design-time license of all the ActiveX controls used by the application being migrated; installing just the runtime license isn’t enough. The easiest way to check that you have installed the design-time license is loading the VB6 project inside the VB6 IDE and compiling it. In most cases, VB Migration Partner is able to convert VB6 projects even if their .vbp file contains one or more invalid paths, yet in some circumstances VB Migration Partner may fail to guess it correctly. If in doubt, just reload the VB6 project inside the VB6 IDE, make a minor edit to any source file (for example, insert a space at the end of a code line), and then save the project: this action typically forces the VB6 IDE to re-evaluate the correct path for all controls and type libraries. 13. Are you sure the original Visual Basic project was updated to VB6? Some VB6 business applications were initially coded in VB4 or VB5. In some cases, these applications – or at least some of their constituent projects - were just recompiled under VB6 but were never really converted to VB6 and their source files still contain leftovers from VB4 or VB5, for example attributes that VB6 doesn’t support any longer. These attributes are hidden and aren’t visible from inside the VB6 IDE, yet they can prevent VB Migration Partner from correctly migrating the application. 14. Did you clear VB Migration Partner’s type library cache? VB Migration Partner creates a special area on your hard disk, known as type library cache. This area is used to store the result of the analysis of ActiveX controls and type libraries used by the project being migrated, so that subsequent migrations can run faster. In some cases, however, the Type Library Cache may become out-of-sync and you should clear it and start again with an empty cache. The easiest way to clean it up is enabling the “Clear type library cache when VB Migration Partner starts” option, in the General tab of the Tools-Options dialog box, then closing and restarting VB Migration Partner. After you have cleaned up the type library cache, you might want to disable that option, so that subsequent migrations can run as fast as possible. 15. Did you insert your pragmas correctly? You cannot insert a pragma inside a form or UserControl’s definition area – i.e. the area in the .frm or .ctl file used to define the form and its controls’ properties. You cannot insert a pragma in the middle of multiline VB6 statement. Also, keep in mind that if a pragma has an incorrect syntax you should find an error message in the Activity Log window, at the end of the migration process. 16. 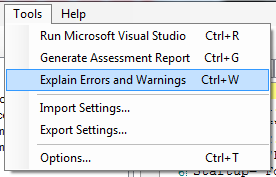 Did you try the “Explain Errors and Warnings” command? If the migration completed correctly but you are puzzled by the many error and warnings messages found in VB Migration Partner’s lower pane, you should run the Tools-Explain Errors and Warnings menu command. This command brings you to a page that summarizes and explains all the messages in your migrated code and recommends a strategy to solve them. You need an active Internet connection to run this command. 17. Still annoyed by the “One or more compiled files of the selected solution aren’t up-to-date with the source code” message? When you start a conversion, VB Migration Partner compares the timestamp of the VB6 executable file – be it an EXE, DLL, or OCX file – with the timestamp of all the source files that are part of the project being migrated. If any source file is newer than the executable file, VB Migration Partner displays the dialog box in question. 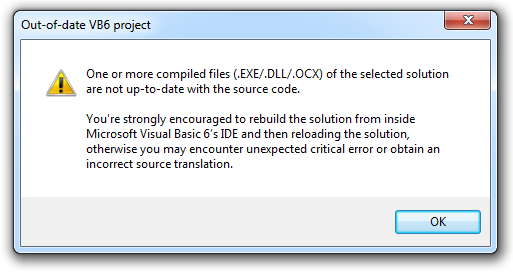 Some users complain that this dialog box appears even if they have compiled the VB6 project from inside the VB6 IDE, an action that is supposed to save all files before the actual compilation takes places. However, this isn’t correct, because the VB6 IDE compiles the source files in memory, without having to save them to disk. Additionally, in some cases the compilation process flags the VBP file as “dirty”, therefore this file is automatically updated when you exit the VB6 IDE or you issue the File-Save Project menu command. As a result, the VBP file appears to be newer than the executable file. Exit the VB6 IDE – if a dialog box appears and informs you that the VBP file needs to be saved then cancel the exit operation and repeat steps B-C-D.
18. Did you create a sample project that reproduces the problem? If you are trying to solve a problem that occurs either during the migration process or when you run the migrated .NET project, it is essential that you provide a self-contained VB6 sample project that allows our tech support team to reproduce the issue. Without such a sample project we might unable to work on your problem and offer you the solution. We understand that creating a sample project can take some time; however, please bear in mind that if you don’t prepare such a sample project, we have to do it anyway. In some cases we might not have enough information to create the sample and reproduce the problem. Also, if preparing the sample requires a lot of time, we must give your request a lower priority, so that we can focus on other requests that were accompanied by a complete sample. All the 3rd-party controls that are used by the VB6 project. The .NET project you obtained from VB Migration Partner (if the problem occurs at runtime). An exhaustive description of how to reproduce the problem (if the problem occurs at runtime). Please help us provide you the best tech support.